SAN DIEGO (April 3, 2019)—While most members of the U.S. Navy conduct deployments at sea as part of U.S. Navy warship crews, each year thousands of sailors are called upon to conduct non-traditional deployments, often in austere locations outside the maritime environment, in support of military missions around the globe. A Capitol Heights, Maryland, native and 2002 Suitland High School graduate is one of these sailors. Petty Officer 1st Class Michael Anderson is serving in the U.S. Navy with Explosive Ordnance Disposal Expeditionary Support Unit One, operating out of San Diego. Anderson is a Navy counselor responsible for making sure the sailors are prepared for the next step in their Navy careers. Anderson credits success in the Navy to many of the lessons learned in Capitol Heights. Being stationed in San Diego, the principal homeport of the Pacific Fleet, means Anderson is playing an important part in America’s focus on rebuilding military readiness, strengthening alliances and reforming business practices in support of the National Defense Strategy. Though there are many ways for sailors to earn distinction in their command, community and career, Anderson is most proud of earning a Navy Commendation Medal. 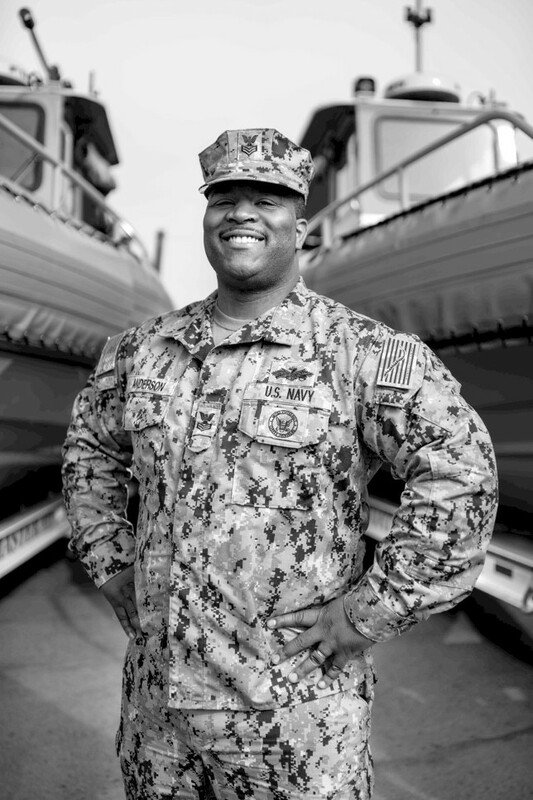 Serving in the Navy is a continuing tradition of military service for Anderson, who has military ties with family members who have previously served. Anderson is honored to carry on the family tradition. As a member of one of the U.S. Navy’s most relied-upon assets, Anderson and other sailors know they are part of a legacy that will last beyond their lifetimes providing the Navy the nations needs. On behalf of the residents of Prince George’s County, we extend our deepest condolences to the family and loved ones of Staff Sgt. Slutman, who was mortally wounded by a roadside bomb in Afghanistan on Monday [April 8, 2019]. Staff Sgt. Slutman gave his life to keep us safe, and while service was his calling, the loss is immense. We stand in support of his family and loved ones, especially at this most difficult time of grief. Prince George’s County will host a Countywide community clean up program entitled “Growing Green with Pride.” This event supports our Beautification Initiative to make our community cleaner and greener by conducting individual community plantings and coordinating beautification activities throughout the County. “Growing Green With Pride”, in collaboration with Keep Prince George’s County Beautiful, Prince George’s County Public Schools, and The Maryland-National Capital Park and Planning Commission, demonstrates our shared commitment to keeping our communities appealing and attractive. Community organizations and groups are encouraged to participate. We will be holding our Inaugural “Growing Green with Pride Day” event on Saturday, May 4, 2019 from 8 a.m. until 12 p.m. Following our clean-up efforts, all participants are invited to join us for a free celebration with food, prizes and entertainment at Watkins Regional Park. In order to participate everyone must register their Growing Green With Pride Crew by going on-line to www.princegeorgescountymd.gov/2590/Growing-Green-With-Pride. You may register your ORGANIZATION or register as an INDIVIDUAL. Individuals will be assigned to assist an organization as close to your address as possible. The deadline is Friday, April 19th. Early, online registration is encouraged. Thank you for working with us to keep our county green and clean. Please help spread the word by sharing this information with your neighbors, friends, organizations, schools and the community-at-large. If additional information is required, please contact Stacy Howard at 301-499-8523 or sdhoward@co.pg.md.us. We look forward to you joining us for the Inaugural Growing Green with Pride Day! Annapolis, Md. (April 11, 2019)—Lt. Governor Boyd K. Rutherford today opened the 4th Annual Maryland Crime Victims’ Rights Conference at the Adele H. Stamp Student Union at the University of Maryland and presented Governor’s Victim Assistance Awards to three citizens who went above and beyond the call of duty to assist crime victims. The week of April 7–April 13, 2019 mark[ed] Crime Victims’ Rights Week, which is recognized nationally every year. The conference was made possible by the collaboration of the Maryland State Board of Victim Services and the Governor’s Office of Crime Control and Prevention. More than 400 attendees, including representatives of leading victims advocacy and service organizations, gathered to discuss innovative best practices and tools to serve victims of crime in Maryland. The national theme of Crime Victims’ Rights Week this year is “Honoring Our Past, Creating Hope for the Future,” and the lieutenant governor and subsequent speakers discussed efforts to expand protections and services for victims in Maryland. Lt. Governor Rutherford detailed the administration’s support of several major initiatives from the governor’s legislative package to protect and empower victims of crime during the 2019 session of the Maryland General Assembly, which ended on April 8. The administration worked with a bipartisan coalition of advocates and legislators to successfully pass legislation that classifies human trafficking as a crime of violence. This classification will allow prosecutors to push for harsher sentences against human traffickers. The Hogan Administration has provided more than $60 million in grant funding for victim services. Included in this grant funding is a major expansion of the victim witness relocation and protection program. In 2018 alone, grant funding was made available to support nearly 180,000 victims, to track more than 26,000 protective orders, and to serve more than 10,000 warrants. At the conference, Governor Hogan presented the Virginia Mahoney Award to Debbie Feinstein; the Vincent Roper Memorial Award to Alice Oaks, and Henry Gleim Memorial Award to Angela Brooks—all Maryland citizens who went above and beyond the call of duty to assist crime victims. The Virginia Mahoney Award is given in recognition of a prominent state leader or high-ranking official who has epitomized true leadership in support of victims’ rights. In honor of Ginny Mahoney, who was a longtime advocate for victims of violent crime, the Maryland State Board of Victim Services recognizes an outstanding leader who has set the standard for excellence and professionalism in the field of victim services. The Vincent Roper Memorial Award is given in recognition of outstanding work to secure crime victim justice for all in a quiet and selfless manner. This award is named in honor of Vincent Roper, who dedicated his life to making a difference for all crime victims and whose countless contributions revolutionized victims’ rights. The Henry Gleim Memorial Award is given in recognition of outstanding service to crime victims and those who work to serve them. This award is given in memory of Henry Gleim, an unsung hero who gave unselfishly, generously, courageously, and with hope for those who walk in the path of victimization. “To everyone in this room, and to crime victims all across our state, I want you to know that our administration will continue to make victims’ rights a priority, and we will keep fighting on your behalf each and every day,” said Lt. Governor Rutherford. WASHINGTON (April 12, 2019)—U.S. Senators Ben Cardin and Chris Van Hollen (both D-Md.) have announced $1.4 million in federal funding for the development, financing, and modernization of public housing developments and for management improvements in Prince George’s and Montgomery Counties. This grant was awarded through the U.S. Department of Housing and Urban Development’s (HUD) Public Housing Capital Fund. In the Fiscal Year 2019 omnibus appropriations bill Senators Cardin and Van Hollen fought for increased funding for public housing—including an increase of $25 million for capital funds, which agencies use to update and maintain their housing stock. However, there remains a capital backlog of over $26 billion throughout the public housing portfolio. Trump proposed to zero out the capital fund in his 2020 budget despite this critical backlog. Through the office of Public Housing Investments (PHI), HUD provides funds annually via a formula to approximately 3,200 public housing agencies (PHAs) across the country. PHAs may use Capital Fund grants for development, financing, modernization, and management improvements The Office provides technical assistance to PHAs as well as to HUD Field Offices relating to development, financing, modernization, and management improvements of public housing developments. It prepares quarterly reports to Congress on the status of the obligation and expenditure of Capital Fund grants and implements the statutory sanctions for PHAs that are in noncompliance with the statutory deadlines.